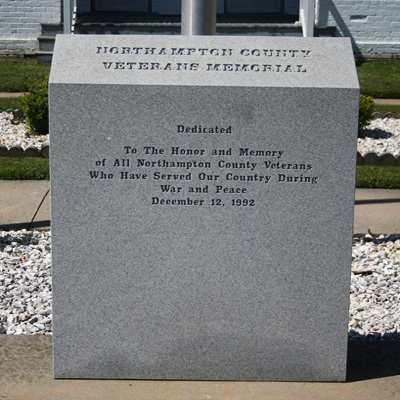 This rectangular marker is about five feet tall and is placed front and center between three flagpoles, in front of the Northampton County courthouse. The marker is located on the south lawn of the Northampton County Courthouse in Jackson, NC, near the intersection of Route 158 and Depot Street. The marker faces South, towards Route 158. The marker is situated on a paved area in the small front lawn of the Northampton County Courthouse, a tiny, one-story, white building.